A new recipe for a Homemade Flower Iced Tea is here! I know, summer seems kind of over but honestly I am not ready to let it go yet. If I think about it, I had the best summer in years. Although, it was the summer of change for me having to let some people go which were really close to my heart. At times I felt restless with lots of questions and doubts in my head. At the same time, this summer opened a lot of new doors and created a lot of space in my head. Space for new experiences, new friends and endless freedom. Freedom to do whatever I wanted whenever I wanted. I went to unknown festivals abroad, I trusted random people for no reason. And again let some love into my heart after I had it left to repair for what felt like a long time. So naturally letting this summer go kind of feels emotionally wrong to me. But I created some rituals on the way reminding me of summer and how important it is to look after myself from the inside out. One of these feel-good rituals I established was the preparation of my flower iced tea in the morning. Summer was incredibly hot this year. So this way I would have a fruity refreshing drink during the day which kept me hydrated and was way more exciting than just bland water. Cause it had a fruity flavor, looked like a flower garden and tasted slightly sweet. And I kept my iced tea ritual until today especially after a work out in the warm autumn sun. Along the way, I tried a lot of loose teas and really fell in love with the Masterpiece collection of Lebensbaum. 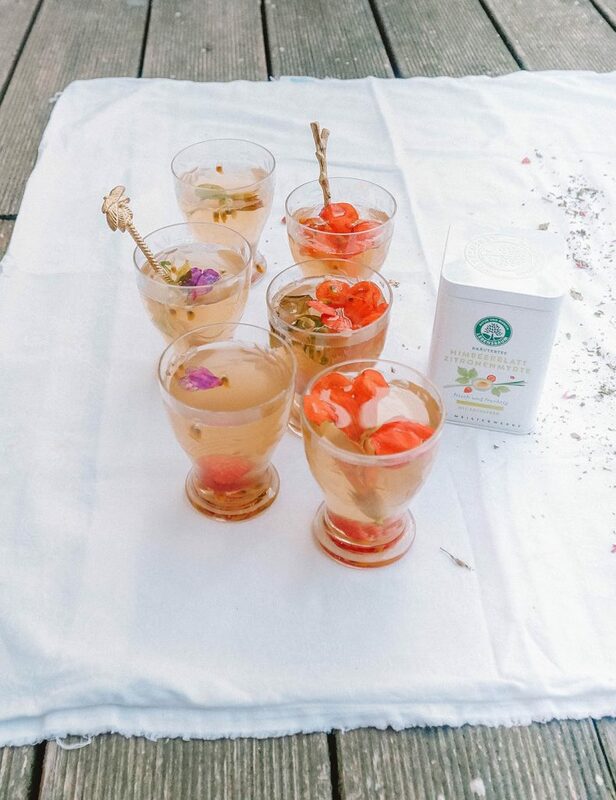 They are not only stunning in taste but also esthetically so beautiful as they mix a myriad of healing herbs and gorgeous colorful flower petals. Their teas have become a staple in my kitchen and the work beautifully for cold and warm tea brews. The one I am loving most at the moment is the raspberry leaf and lemon myrtle. It literally does look and smell like a field of flowers. 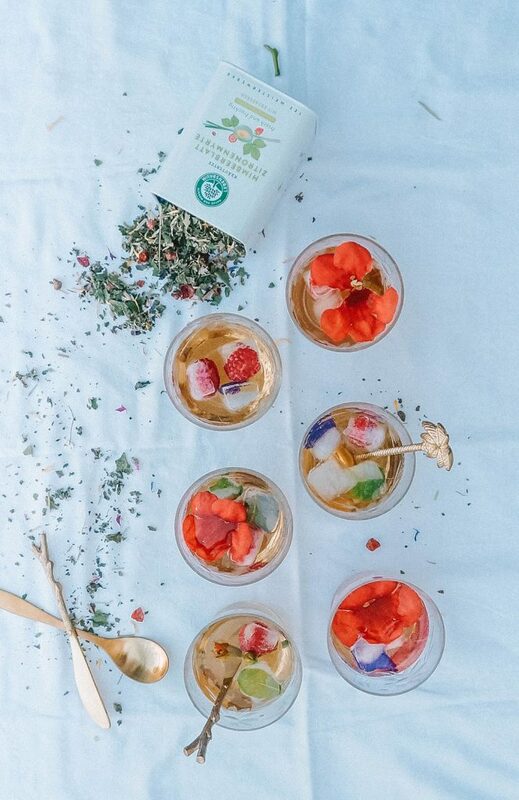 It features flavors of strawberry and raspberry leaves, lemon grass, sweet blackberry leaf, mint, orange peel, strawberry, lemon myrtle, and cornflowers. 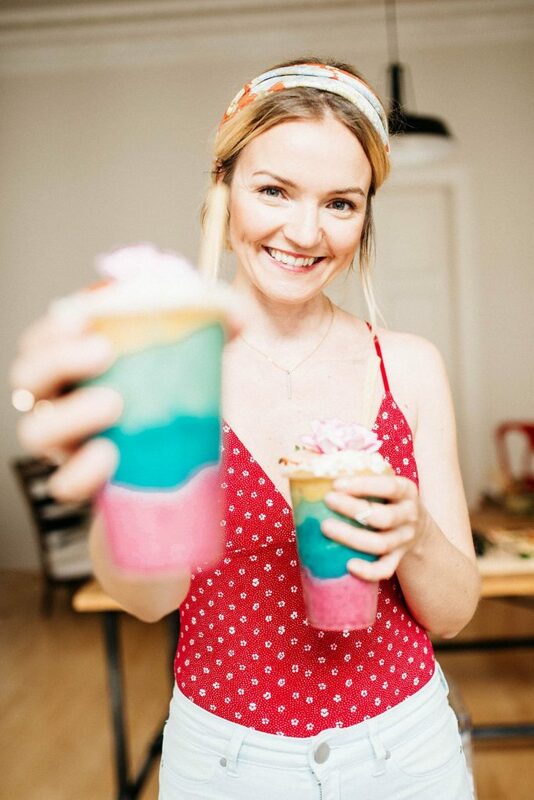 Here is the recipe for my favorite summer flower iced tea. What are your rituals reminding you of summer? I would love to hear about it! Start by preparing the flower ice cubes. Place one flower in each ice cube form and fill up with water. Freeze for 2 hours. Prepare the iced tea by boiling the water. Add the loose tea to the tea filter and pour in hot water. Let the tea steep for 8 minutes. Remove the tea and place the jug into the fridge. Once entirely cold (at least 2-3 hours), add the flower ice cubes, a dash of fresh lime and the agave syrup. Mix well and enjoy with a metal straw for minimal waste. If you are into healthy summer drinks, you might like my Adaptogenic Hot Chocolate Elixir, Coconut Milk Kefir and Pink Dragonfruit Milk.